There is not a lot of sea grass or algae in the water for the sea turtles of Oahu to eat. However, on Turtle Beach, there are several rocks that are covered in algae. Every day at low tide, the turtles slide themselves out of the water, and come up onto the rocks to eat. I was always led to believe that turtles are really awkward on land. However, these turtles seem to have no trouble at all scooting around. You could even see turtles that were not up on the beach playing in the waves. The lifeguard on the beach sets up a barrier to keep people from getting too close to the turtles, and you can’t go swimming in the water directly in front of where they come ashore. However, it is magical to watch them from behind the barrier and enjoy seeing sea turtles in a whole new way. While in Hawaii on the island of Oahu, we went to a place called The Pupukea Maine Conservation District. Within that area, there are a few places that you can snorkel. 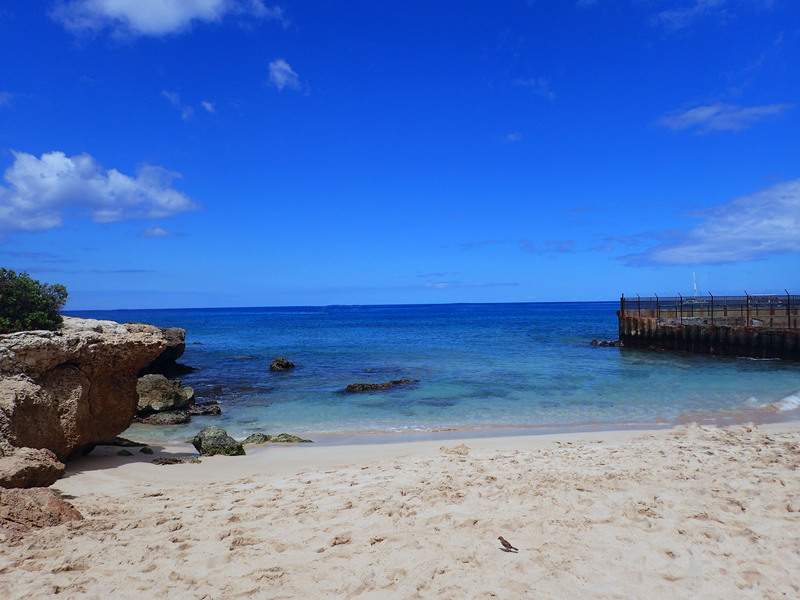 We initially tried to go to Waimea Bay, because we had heard good things. However, there was no parking. I was really glad that we ended up where we did, because we saw so many green sea turtles! Turtles are one of my favorite animals, and I adore sea turtles. 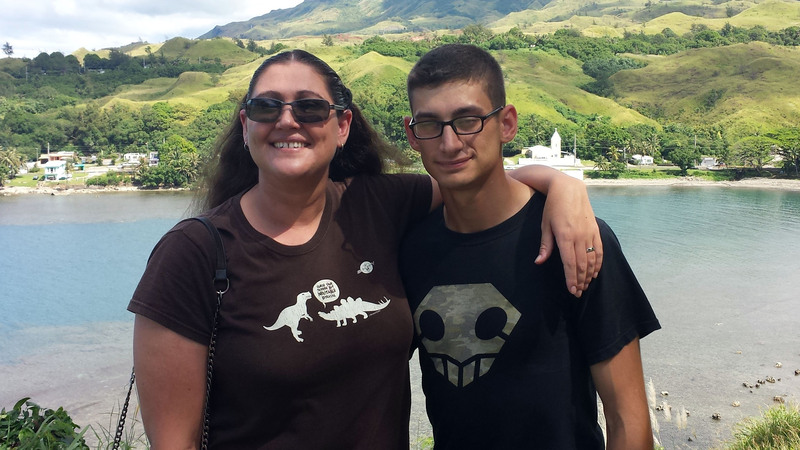 There is one back home in Guam that I love to go visit. They aren’t sharp, but they are full of baby sea urchins, so you wouldn’t want to touch the rocks. However, as long as you are careful, there are a lot of really beautiful things to see. 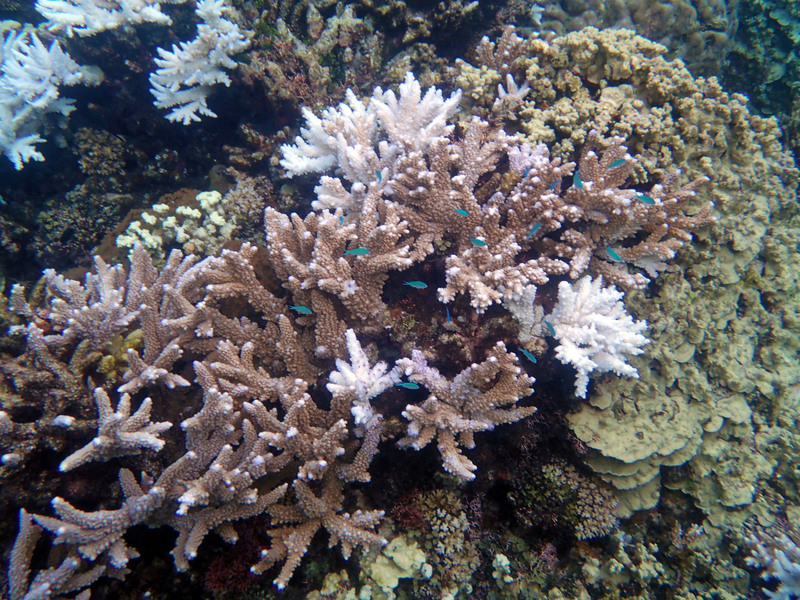 There are some flat corals, and lots of fish. The turtles looked a little worse for wear. Quite a few of them had shell of flipper damage. However, they were reasonably calm around us. We didn’t get too close (obviously) because of the restrictions in the endangered species act. Seeing them from a distance and being able to zoom in and get video was pretty magical, though. The waves were high, but the water seemed calmer than on the other side of the island. There were certainly more people swimming, and we didn’t see any dramatic rescues of screaming people like at Electric Beach. I recently went through Hawaii on my way home to Guam. 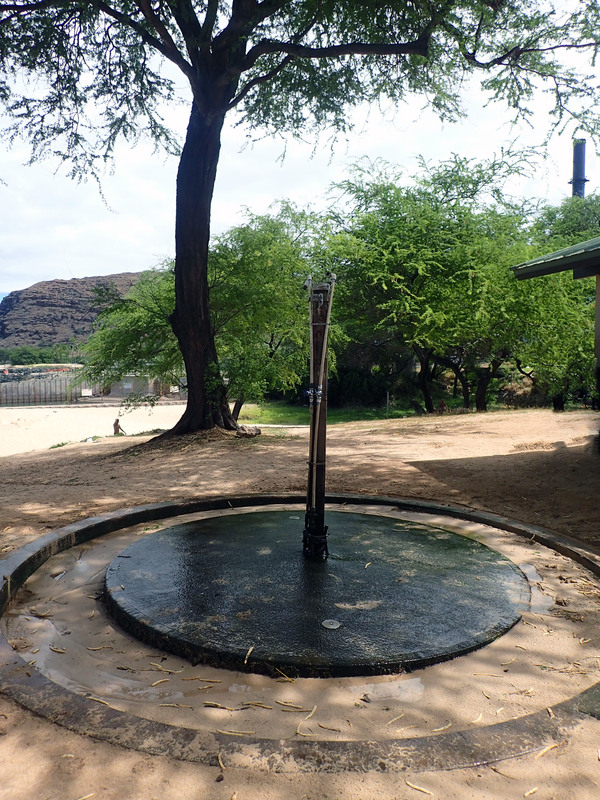 We were only on Oahu for a few days, but Electric Beach at Kahe Point was one of the best things I saw. You park across the street from the Power Plant, and then walk past the bathrooms onto the small strip of beach. There are a lot of signs on the cliff side as you walk down, warning you of the dangerous water conditions. There are also signs on the little strip of beach, telling you not to go in the water in front of the power plant. The signs have a point. What you want to do is go to the ramp, and swim straight out from the ramp for about 200 feet. Then, bear to the right just a little. There are pipes (that are buried) with some coral on top. Follow those out. You can see the bubbles from where the pipes let out. The water from the power plant is warm, and it attracts a lot of different sea life. It’s important to be careful. If you get down in front of the pipes, the rushing water will push you out to sea and you will have to swim back. The best place to be is right before the opening of the pipes, so that you can watch the animals that come to hang out. We saw lots of amazing things, including a black trigger fish and several schools of baby fish. Of course, the best thing we saw was a sting ray, which hung around and played in the water with us. However, there were all kinds of things to see. The are pillow star fish, sea urchins, trigger fish, and much more. 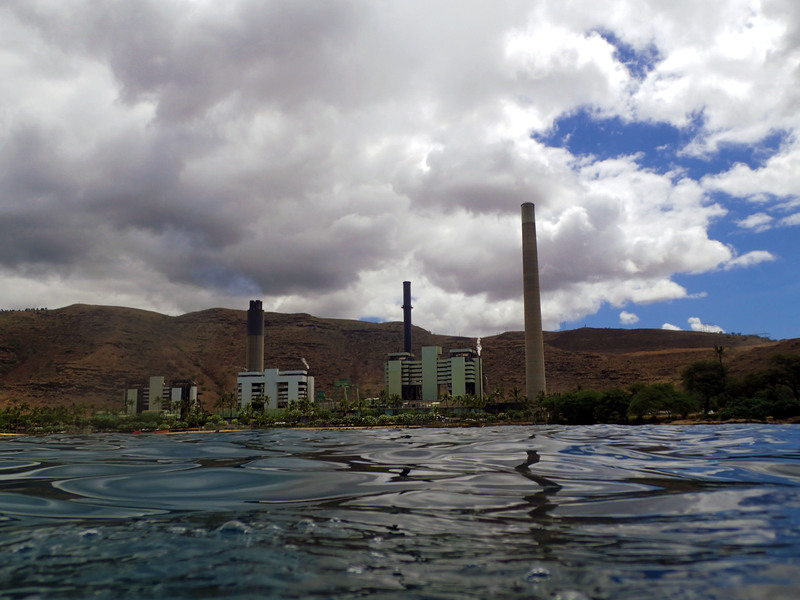 If you stick your head out of the water facing shore, you can see the power plant. This is what it looks like. When you get out, they have showers! If you snorkel often, you know how awesome that is. I hate having to drive home salty. Again, I should caution you about the dangerous waters. We saw some people get caught in a rip tide and pulled into a rocky area. They had to be rescued. 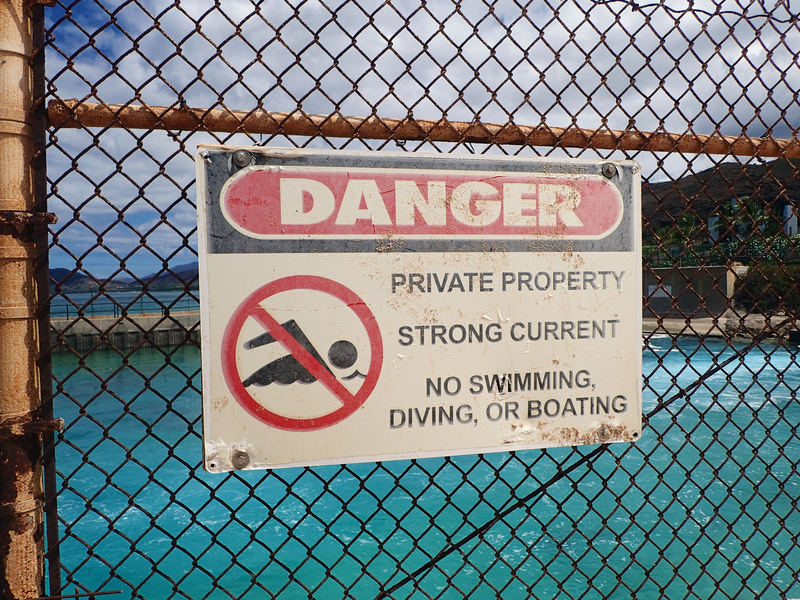 Make sure you are a strong swimmer before you try Electric Beach. I don’t know what he called himself. However, he had a small metal tag under each front flipper. One said NOAA Maui USA, and the other said PI2775. He was a green sea turtle who was approximately 50 years of age, and he had a girl turtle in the Piti Bomb Holes near by that he seemed to visit with. In Mid-July, the tour operators at Fish Eye watched as people from the Department of Agriculture came and took Larry the turtle away. They said they were taking him “to study,” according to the tour operators. Now of course, this was not his first time being caught on Guam. The Marine Biologists at Underwater World took him for study. They weighed him, measured him, and then released him on the other side of the island. He swam right back, because he enjoys people and food. 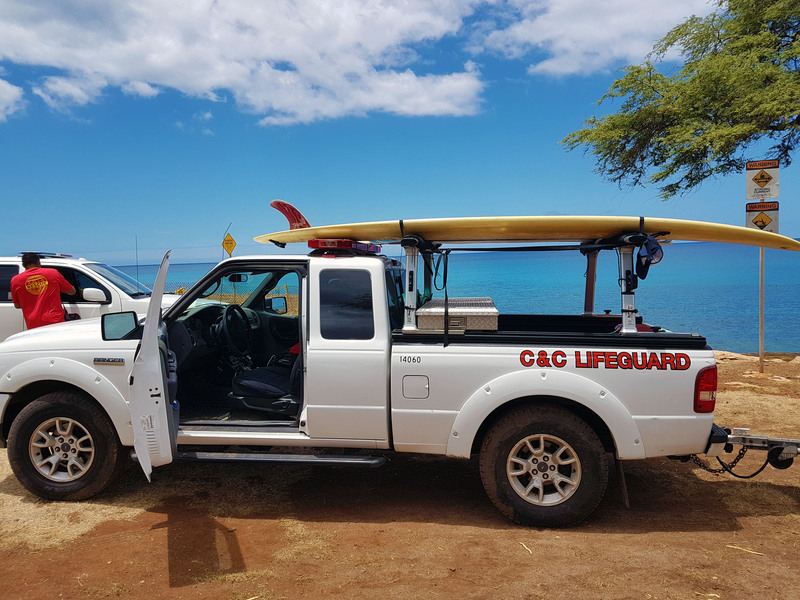 However, after the Department of Agriculture claims to have taken him “to the other side of the island,” he did not swim back. He was a very strong swimmer, and you can be sure that he was capable. How can you be sure, you ask? Well, the people at Underwater World were actually hoping that they could find some evidence that his rear flipper (which was damaged) made it too difficult for him to be in the wild. They hoped this because they have a rescued sea turtle in the aquarium already, and they hoped for a second. Ergo, we know that if the turtle had actually been released by the Department of Agriculture, he would have swam back as he had done before. We cannot make conclusions from the information that we have. However, we can know two things for sure. 1. Turtle meat fetches a high price on Guam and on the other islands in the chain, because the Native people eat turtle. They know that these turtles are endangered, but some choose to do it anyway. Anyone who took the turtle to sell would have made a LOT of money. 2. They were very suspicious on the phone and asked for my husband’s full name and information before claiming that the turtle was moved. If they are keeping track of who is asking, then one would suggest that they have a reason to be worried. I am not saying that the Department of Agriculture sold the turtle. However, I am saying without a doubt that they were the last people to have him, and that in two months, he has still not been sighted anywhere else. If they did not sell him, then their choice to move him certainly seems to have brought about his untimely demise, leaving his girlfriend single and removing his genes from the species. Furthermore, I spoke with several tour operators who said the initial complaint against the turtle was falsified. They claim that he was good for business and made the tourists happy and that they would never have done anything that led to his removal. I hope that there will be an investigation, since selling an endangered species for profit is obviously illegal. However, given the diminished funding of the EPA, I worry that justice will not be served. I have also not seen the female turtle who was hanging around the Piti Bomb Holes near Fish Eye. However, I am not sure that not seeing her is significant. Green Sea Turtles are not social, and it is possible that she was just around to “visit” a boy turtle for a bit. She was a little smaller than the male turtle, but they seemed similar in size and age. The point of this post is that if anyone has any information about the green sea turtle lovingly called “Larry” or “Crush” who used to live at Fish Eye Marine Park, please let me know. This album is from May of 2017. This is just some of the coral beaching that I have seen around Guam. I am trying to let NOAA and UOG know. It won’t help solve the problem, but it will help document what is happening. Maybe I find documenting it comforting because at least I am doing something. It’s not a something that fixes anything, but it’s something. If you know anyone in Marine Biology, make sure to pass this information along to them. 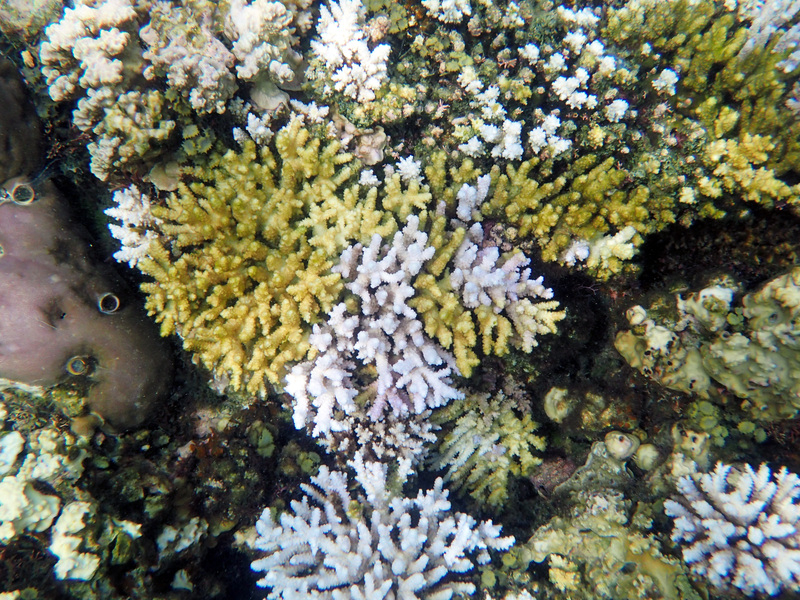 Healthy coral has color to it. In the picture above, you can see healthy coral thriving at Gab Gab reef on May 2nd, 2017. This is what it is supposed to look like. Unfortunately, the coral around the world is dying, and I want to talk about it for a moment. 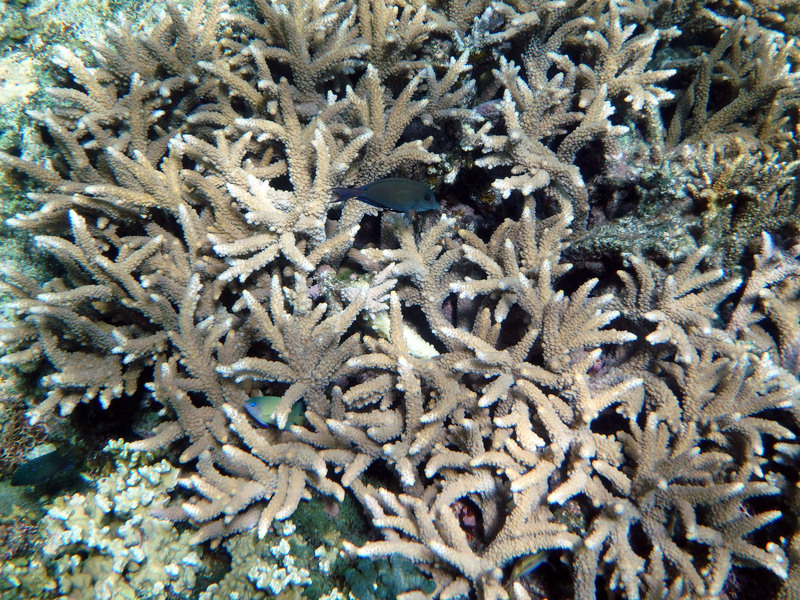 Coral is made up of many tiny animals called Polyps. These little animals have specialized chloroplast cells inside called zooxanthellae. These chloroplasts absorb sunlight and convert it to food for the polyp. Without them, a polyp will die. 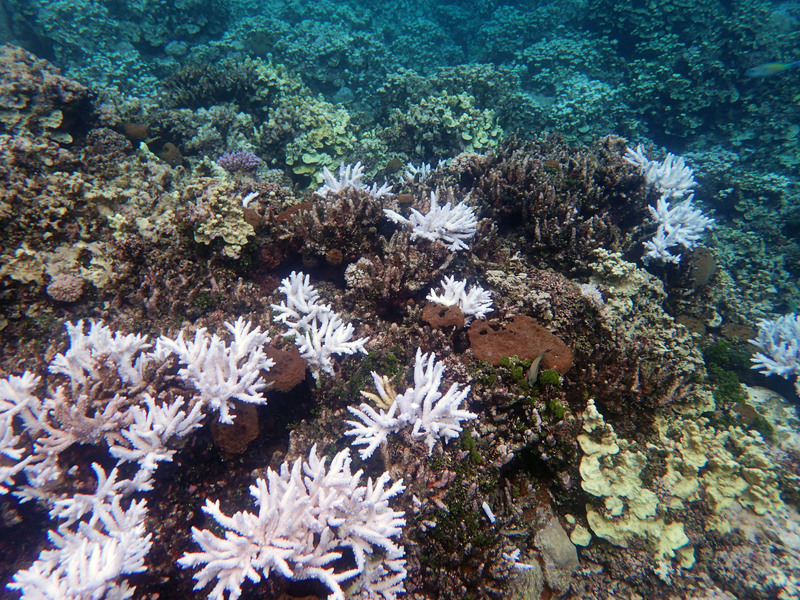 When the water temperature in an area gets too hot, the zooxanthellae stop being able to work. They are sensitive to temperature, and so they die. 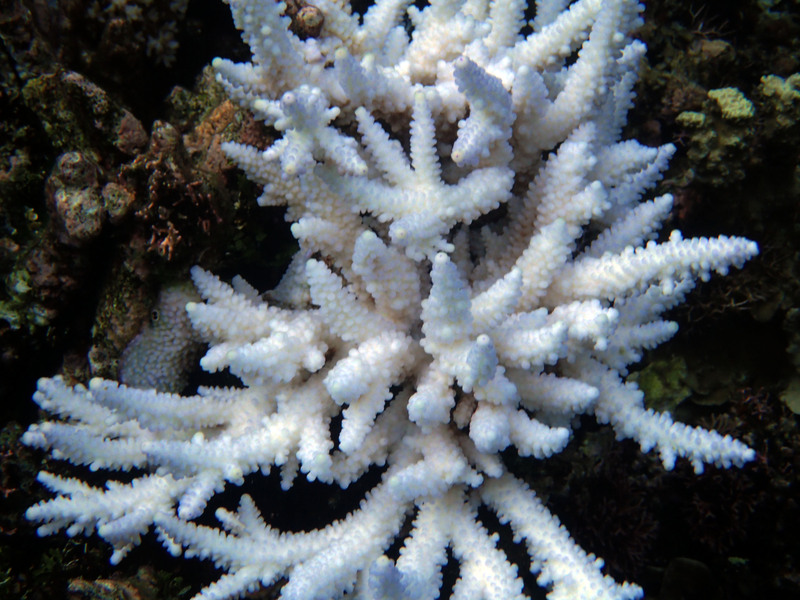 When they die and the polyp pushes them out, the coral becomes white (since polyps have no color.) Eventually, the polyps die and the coral becomes nothing more than skeletons covered in algae. The reefs on Guam are bleaching. This is part of a worldwide event, which is being driven by climate change. I wanted to share these pictures and videos in an effort to draw attention to the fact that this is happening, and how awful it is. These pictures are taken at Gab Gab, just like the one at the top of the page. The difference is only a few months, but the difference in the temperature in the water is extremely noticeable. Before, it used to be a little chilly when you first got in. 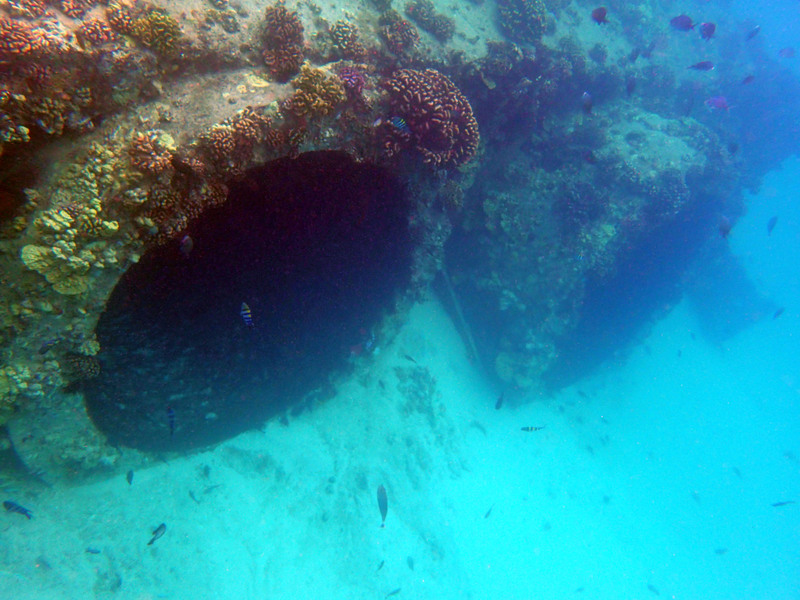 Gab Gab is a reef that goes from the surface water level down more than one hundred feet. Deeper water, in my experience, tends to be colder. And yet, yesterday when I got in the water, it was hot. I beg you all to take a very close look. I think a lot of people who have never been snorkeling or diving are able to easily ignore the bleaching of the corals and the dying of the reefs. For me, living here, it is much harder. Coral are home to thousands of species of animals, and as they die, those animals will also die. The diversity of life that we had in our oceans was amazing, and losing it is absolutely horrifying. I have no words beautiful enough or sad enough to write the eulogy for our oceans. 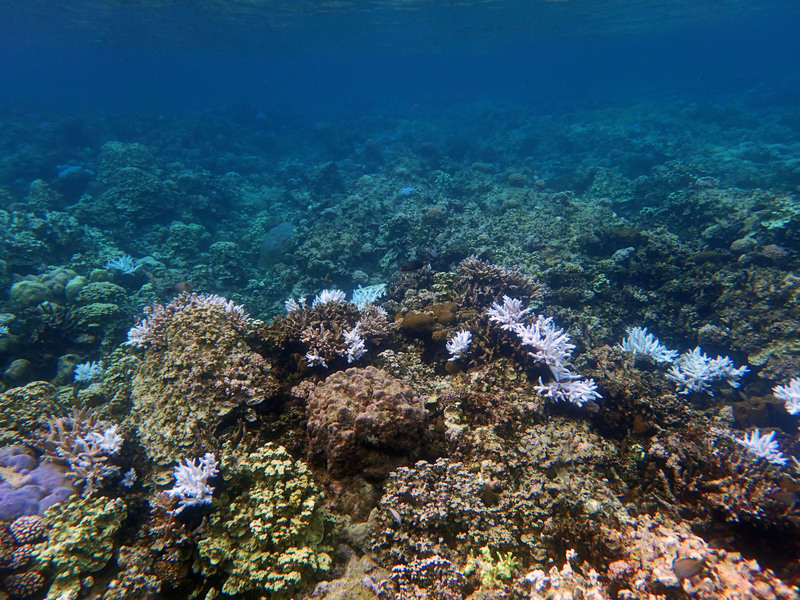 Nothing said or written could capture how beautiful this reef was just a few months ago. 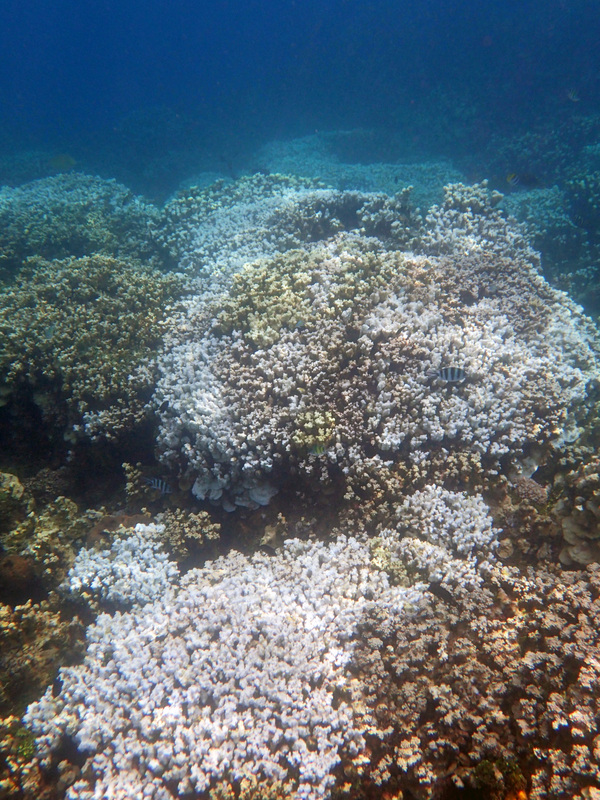 Seeing the reef now as it bleaches and dies is one of the most painful things I have ever seen. Over the month of August 2017, I wrote about some of my very favorite things that I have done for work. I thought I would write a post summarizing what I talked about over the last month, and what I learned from all of the cool experiences that I have been lucky enough to have. 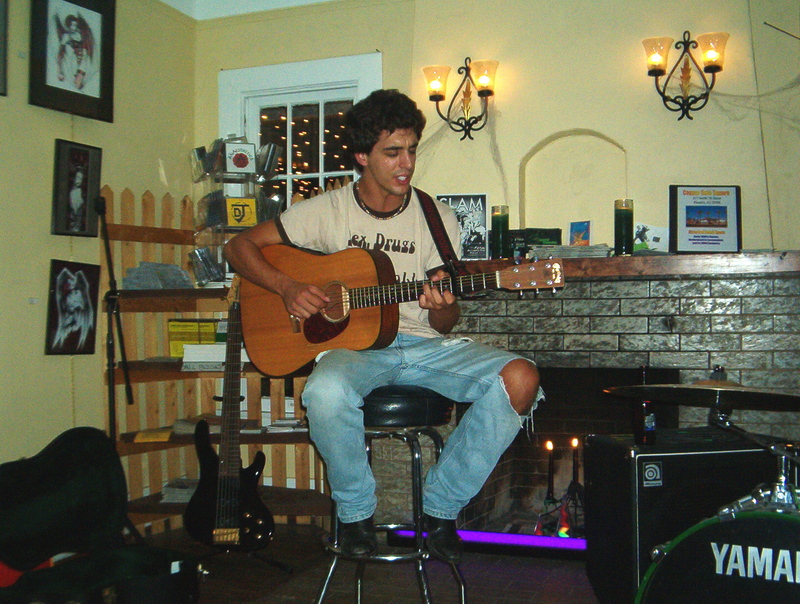 In my 20’s I worked a lot with artists and musicians in various capacities. First as a promoter for concerts with Third Eye Promotions, but later in other capacities. Working with artists and musicians taught me patience. Many of them are very wrapped up in their own world, and so there is a lot of listening and being accommodating required. Of course, it’s also important to always have a backup plan and make sure that everything is organized way in advance. That way you can work around an artist having a meltdown and being unable to do what they are supposed to. 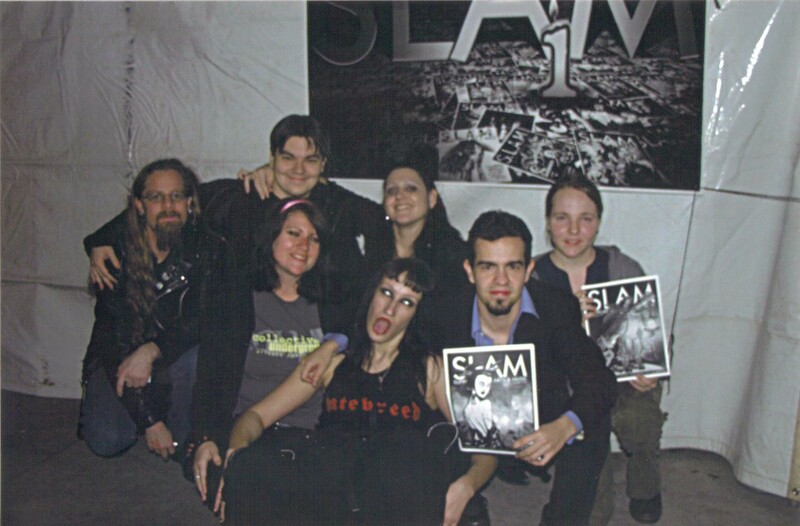 I was the editor of S.L.A.M. 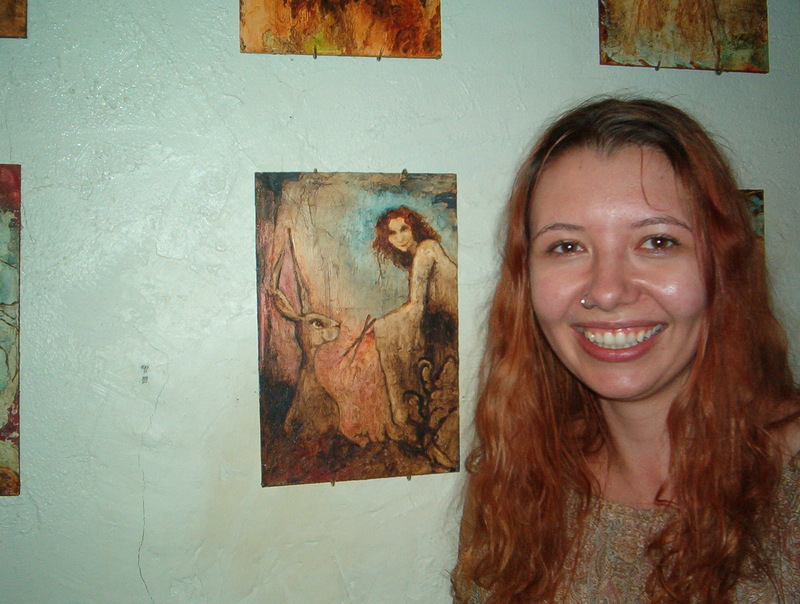 (Support Local Arts & Music) Magazine, as well as the curator of Alice’s Restaurant and Gallery. This helped me gain years of experience as an effective manager. As Dale Carnegie would say, you have to talk in terms of the other person’s wants. The paperwork end is easy, but it’s handling the people that is the challenge. Over the years, I was able to learn how to effectively communicate with people, and how to motivate them. 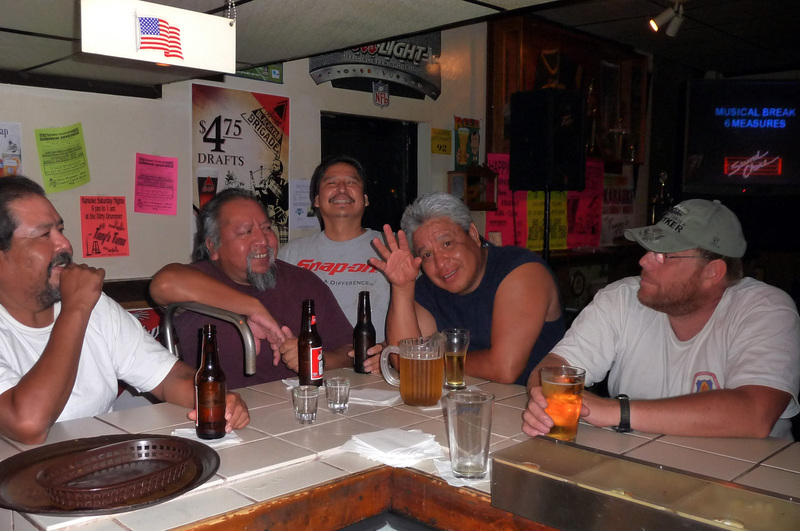 This was during the beginning of the First Friday Art Walk, and when the City of Phoenix was starting Copper Gate Square. It was a wonderful time to be involved in local arts and music, and I am glad that I had the chance. However, I did learn that culture in a city is not something that just happens. It takes thousands of dollars in investment from a city, in addition to the work of many people. I value the time I spent at Alice’s Restaurant and at SLAM Magazine a great deal. It was a wonderful way to spend the first half of my 20’s. Later I went to Arizona State University. I received a Bachelor’s Degree in Communications (with a minor in Sociology) from the Walter Cronkite School of Journalism at ASU. 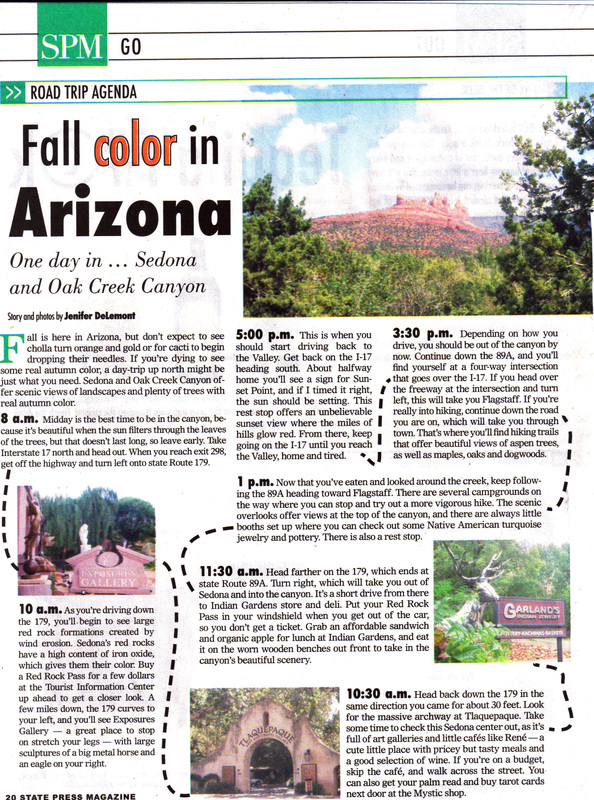 While at ASU, I wrote for State Press News, State Press Magazine, College Affairs Magazine, and The East Valley Tribune. This taught me time management and disciple more than anything else, because I was always so busy. However, I learned a lot more than that. My college boyfriend was an Aerospace Engineer working on propulsion system research, so I learned about writing White Papers to apply for grants. In the meantime, I refused to go into debt. That meant scholarship breakfasts and networking. 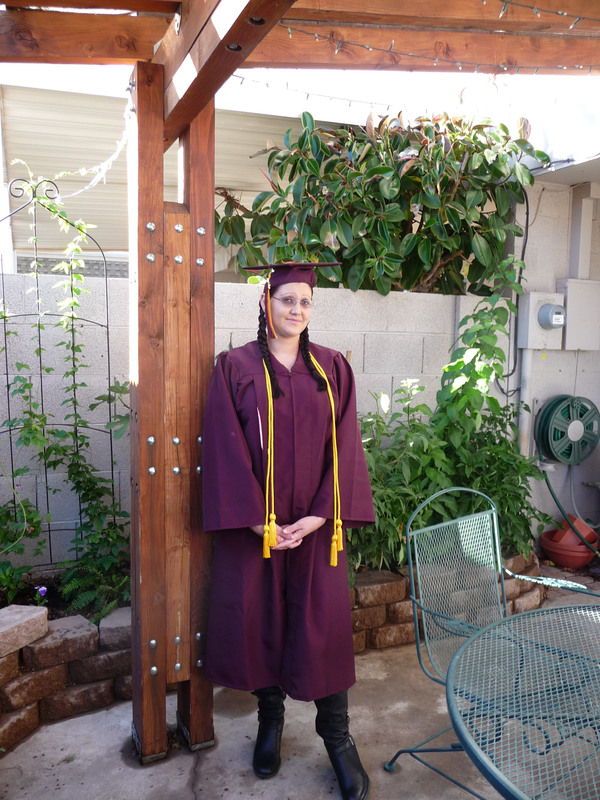 I hardly slept, but I graduated debt-free, having audited classes in Engineering in addition to my degree, and having learned a lot about the politics and funding in academia. 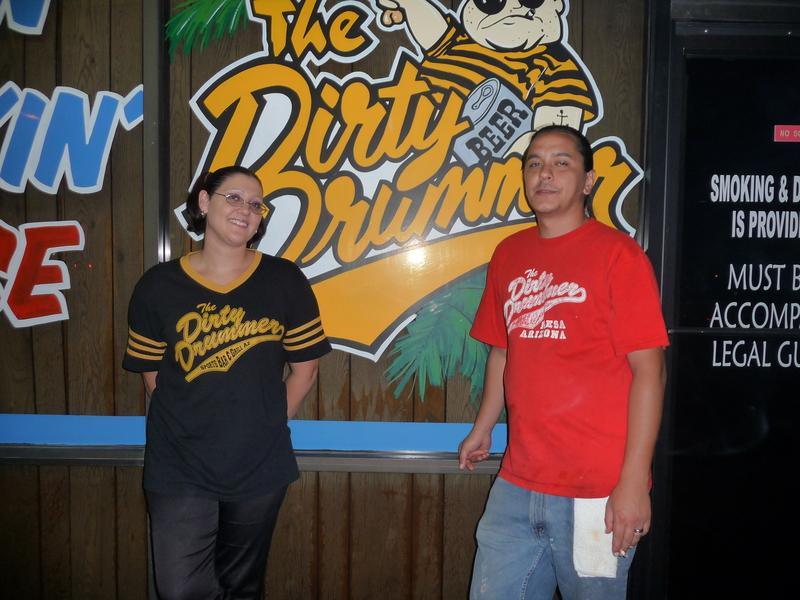 As if I wasn’t busy enough, I also worked as a bar tender part-time at The Dirty Drummer to help support myself. Bar tending definitely taught me a lot about handling people when they are drunk and angry. I saw a lot of the world and learned to strike up a conversation with anyone. Skills like making drinks and getting along with people are very useful, and I am glad that I was able to learn them. 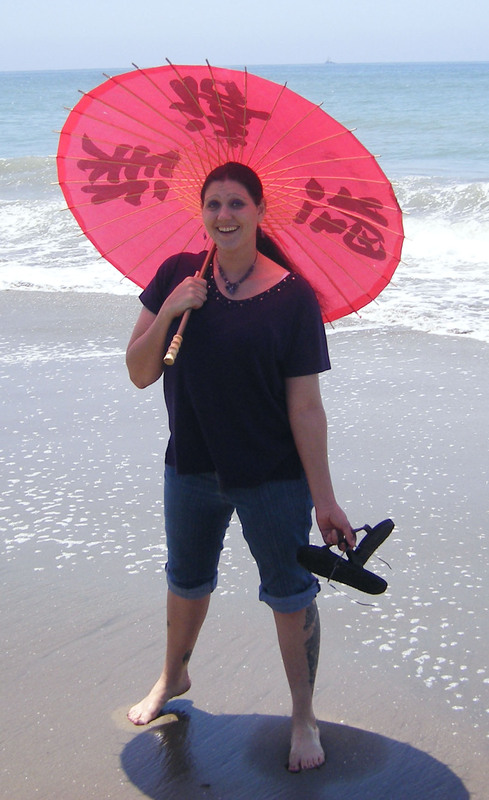 Once I graduated, I moved overseas with my husband, a sailor in the US Navy. I got a job at Avalon English. This helped me learn effective teaching methods and how to write a textbook. 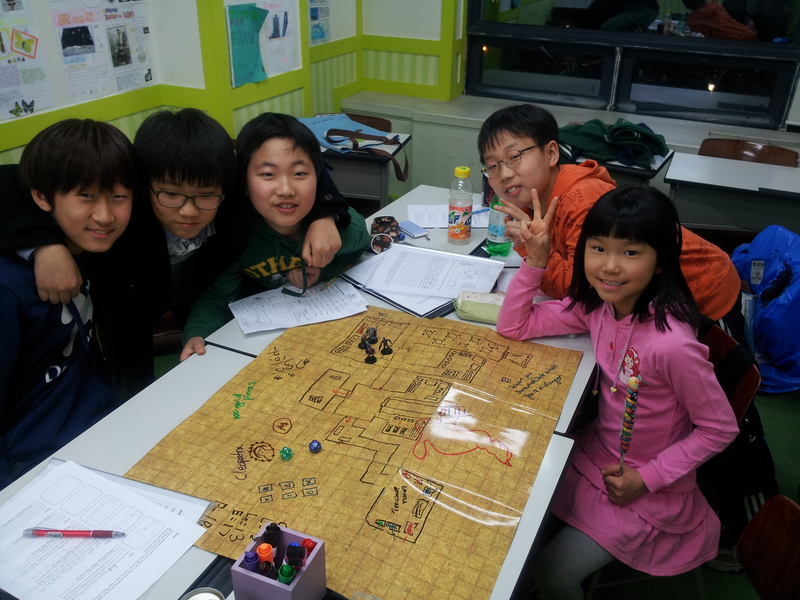 It also taught me to be adaptive, as the culture is very different from our own. However, after three years teaching at Avalon, my husband went for training in Mississippi on an unaccompanied tour. I took that time to see some family in Oregon, which was wonderful. I love the Pacific Northwest. After that, we moved to the island of Guam, which is way out in the Pacific Ocean past Hawaii but not quite to the Philippines. 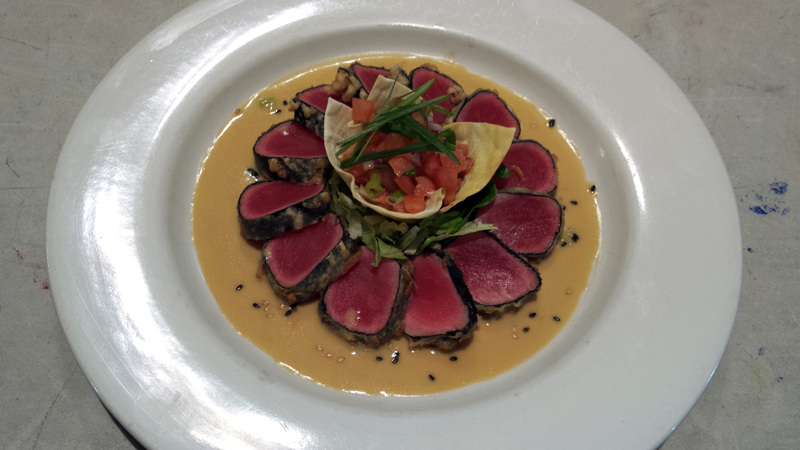 While there, I worked as the General Manager of Sea Grill Restaurant. However, I also worked on a lot of side projects, such as writing a Choose Your Own Adventure audio book called The Vampire’s Sister. Guam was isolated, and so we faced complications because of that. We had plenty of weeks without electricity or fresh vegetables, and I guess that’s just part of living on an island. On the upside, I was also able to get my dive certification and take some classes online. It’s never a bad thing to acquire new and different skills, right? If you come across this post while Googling me before a job interview; hire me. I am dedicated, friendly, and a hard worker. I am usually looking for a job in Communications, because that is what I went to college for and what I am best at. I do have experience in other fields as well, but when I sit down and reflect, my favorite moments were doing Public Relations work for Third Eye Promotions, or doing corporate training at Sea Grill. I love positions where I can use my skills in Communications to help people. So, if you are hiring for a position that is related to Communications, Writing, or Public Relations; please consider me. I would be an asset to any company, and I promise to be cheerful and make drinks at the company parties. After all, I did bar tend my way through college.